ISO Workshop is freeware CD/DVD/BD image burning software created by the talented developers at Glorylogic. Delightful as it is, it's a free tool for both personal and commercial use (kudos!) with several important features worth mentioning. 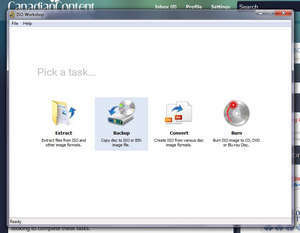 It can clone discs (disc-to-disc image burning), convert between ISO/BIN image to disc, supports Bluray burning and more. Version 8.4 is a freeware program which does not have restrictions and it's free so it doesn't cost anything. For security reasons, you should also check out the ISO Workshop download at LO4D.com which includes virus and malware tests. Additional screenshots of this application download may be available, too. ISO Workshop has a presence on social networks.